In the vast majority of cases, current tactics for generating traffic typically rely on historically proven methods. Most people are aware of these methods and rely on them to produce higher rankings and, hopefully, increased traffic by qualified visitors. And that is great. Those employing this strategy are probably doing better than their competition. That said, the strategy has a lot of room for improvement. It may not be a problem now or in the near term, but it will most definitely be a problem down the line. The issue is that these tactics are backward looking rather than forward looking. A good example of this is how disruptive the changes to Panda, Penguin, and Hummingbird were to many search marketing plans. Forward looking marketers anticipated these changes and benefitted from them rather than suffering a loss in rankings. How far out should we be looking? How does 2030 sound? Back around 2009, Radar Networks produced this graph that tracked the productivity of search marketing versus the amount of data from 1980 out through 2030. Notice the time period at which the productivity really begins to fall. 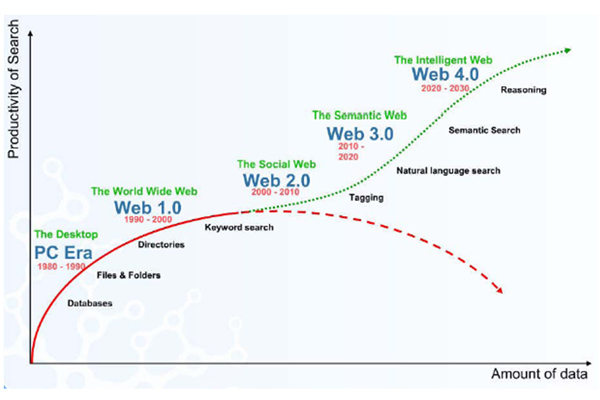 It is the same time period that Tagging and Natural Language Search overtake Keyword Search as the primary drivers of the Web. And that began a few years ago. Another significant item on this graph is the exponential growth of productivity beginning around the present day and moving forward towards 2020 and beyond – a mere six years from now. There’s a reason that first point is so important. Over 90% of the websites I analyze receive close to, if not over, 80% of their traffic from brand-related keyword phrases. This indicates a few things. First, most of the traffic being generated is either from existing customers or from people who are familiar with the brand. Second, there is a lot of upside potential to open new markets with people who are unfamiliar with the brand, and proves the increasing value of long-tail keywords. Should you be skeptical, I’ve witnessed over $500,000 in search revenue generated by non-brand keywords in less than one year; that is nothing to take lightly. Implementation of these six items will result in more rich data being displayed in results; and greater exposure by being associated with events, attractions, historical dates, etc. in a contextual setting versus keyword optimization. I’ll address each of them individually in upcoming posts. Stay tuned!